And here's a perfect illustration. This 1971 article pictures a Junior Sophisticates red jacket & navy skirt (at left) and a vintage Anne Klein suit shown in pairings as originally sold. 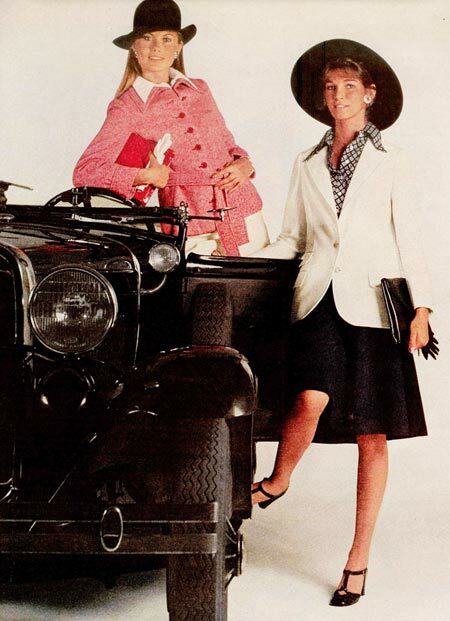 The following page changes it up, with Anne Klein's vintage blazer paired with the Junior Sophisticates skirt and vice versa. A great example of why you should wear vintage suits, complete with antique auto and cheeky Bonnie & Clyde styling. Vintage suits dovetail into modern closets pretty effortlessly, too, because the classic tailored look is just that - classic. A smart investment in vintage style! Source: January 1971 McCall's Magazine.